Caption slip reads: "Photographer: Glickman. Date: 1959-07-01. Reporter: Glickman. Assignment: Sherlock Holmes Day. G119/120: Sgt. 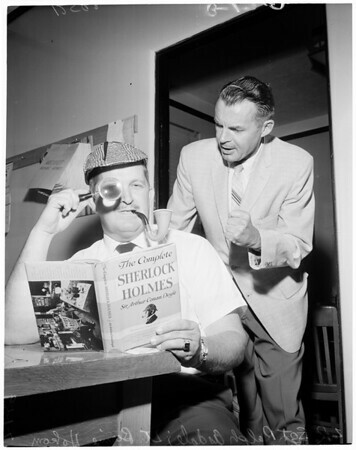 Ralph Asdale seems engrossed in volume of Sherlock Holmes as Lt. Bernie Hokom seems a bit disturbed about his costume for the day. City will honor 100th anniversary of the birth of Sir Arthur Conan Doyle, creator of the immortal Holmes".